Holy crap did winter hit Michigan with a vengeance this week. Unlike people with a normal job, there are no snow days in my line of work. The last couple of days, I have spent a lot of time on the roads white knuckle driving all over the west side of the state. Today, my employer gave me somewhat of a break. I still had to make a trip to Northern Muskegon County, but after that, I had a pretty relaxing evening and time for a decent meal. I drive around a lot on the Southeast Side of Grand Rapids and I come across a lot of rundown looking restaurants that I really want to try. 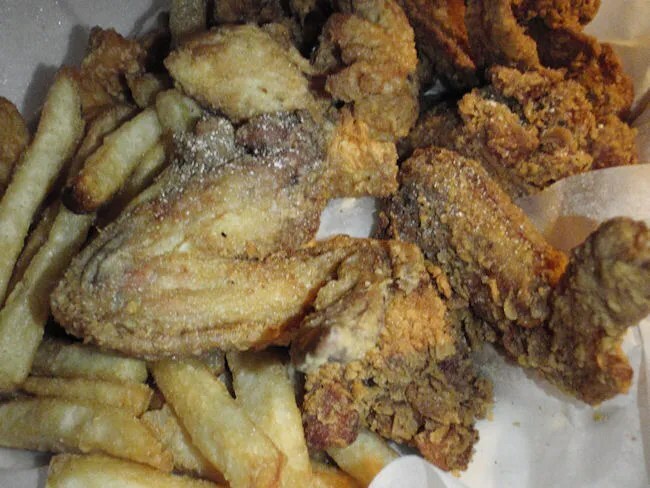 I love “You Buy We Fry” places because they usually have pretty tasty wings. 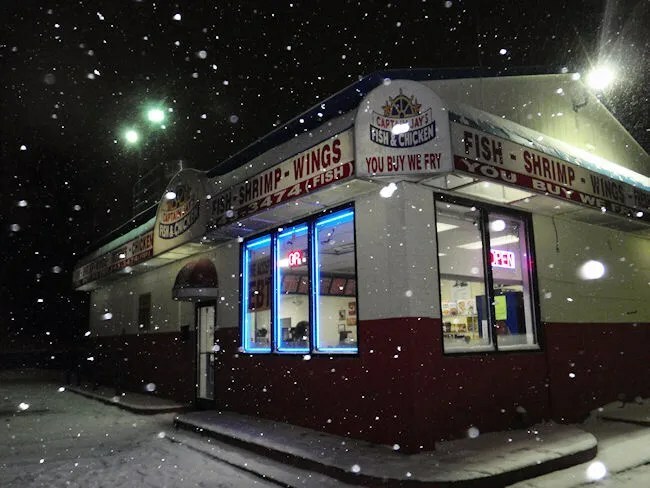 Several times I have driven by Captain Jay’s Fish & Chicken on the corner of Franklin and Lafayette. It has always looked pretty busy whenever I would drive by, but I never really have time to stop. I know I’m going to need 15-20 minutes for the chicken to cook and I don’t always have that kind of time for lunch. 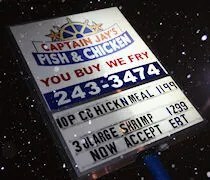 Captain Jay’s is a Detroit based chain specializing in Cajun chicken. The company was founded in 2003 and they have twelve locations with all but three being in the city of Detroit. There are two in Indianapolis and the lone store on the west side of the state on Grand Rapids’ southeast side. The small shop is dominated by the large kitchen separated from a small dining area with the order counter that stretches the width of the restaurant. There are only two or three tables in the place which shares space with a small market area selling pantry staples like bread and hot sauce. There was one person in front of me picking up a called in order and adding a couple more things to what she had already ordered. This seemed to confuse and frustrate the lady running the counter. After a couple minutes, one of the cooks walked up and asked if I was ready to order. I told her what I wanted then she said something to me and walked away. I wasn’t sure if she was going to make sure they had enough of what I wanted or what, but I continued to stand there patiently until the other cook walked up and again, asked if I was ready to order. This time, he wrote it down. I decided to go with one of the combo meals instead of ordering just the wings because I wanted to try the tenders as well. I chose Combo #11. Four wings, three piece tenders, fries, slaw, bread, and a drink for a little over #11. The guy who took my order passed the ticket on to the lady at the cash register then went to work on my chicken. I took a seat at one of the tables and enjoyed the loud music playing from the TV behind me while I waited for my chicken to fry. It only took about five minutes for my meal to cook and I was surprised at how heavy it was when I was handed the plastic bag with the Styrofoam container. I popped the lid on the box and started in on the fries while I was driving. They were a little soggy already from the steam in the box, but they still had a nice crispy exterior and they were dusted with a Cajun seasoning. When I got back to work, I grabbed a wing first. I broke the wing apart and it easily fell apart with little effort. The crispy, spicy wing was very tender and very juicy, but a little on the small side as far as wings like this go. It was very tasty though. The tenders also seemed a little on the small side, but they had the same great Cajun seasoning and breading that the wings had. They were tender, crispy, and very juicy. I say that the chicken all seemed a little small yet I almost couldn’t finish the container of food. While the individual pieces didn’t look like much, the whole meal was very filling and full of fried deliciousness. I like Captain Jay’s. 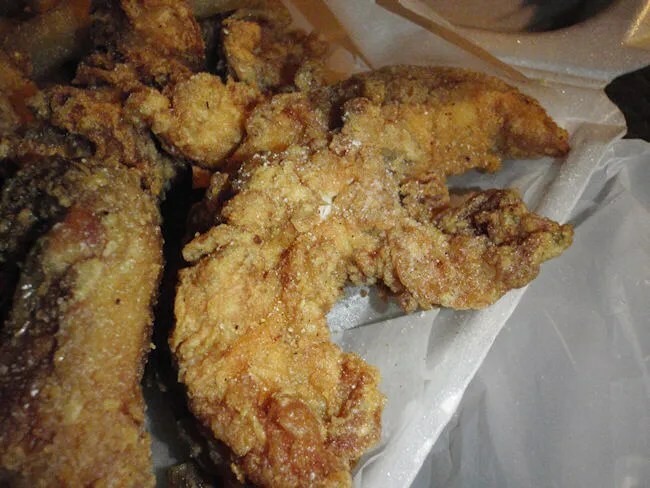 It’s not the kind of food I can eat every night, but we all get those fried chicken cravings from time to time and this place is pretty close to my home base in Grand Rapids.